Tree Responses to Elevated CO2 and the Implications for Forests. Effects of CO2 and Nitrogen on Growth and Nitrogen Dynamics in Ponderosa Pine: Results from the First Two Growing Seasons. Linking Above and Belowground Responses to Rising CO2 in Northern Deciduous Forest Species. The Effects of Tree Maturity on Some Responses to Elevated CO2 in Sitka Spruce. Growth Strategy and Tree Response to Elevated CO2: A Comparision of Beech and Sweet Chestnut. Litter Quality and Decomposition Rates of Foliar Litter Produced Under CO2 Enrichment. CO2 Mediated Changes in Tree Chemistry and Tree-Lepidoptera Interactions. The Jasper Ridge CO2 Experiment: Design and Motivation. Ecosystem-Level Responses of Tallgrass Prairie to Elevated CO2. Direct Effects of Elevated CO2 on Arctic Plant and Ecosystem Function. The Response of Alpine Vegetation to Elevated CO2. Long Term Elevated CO2 Exposure in a Chesapeake Bay Wetland: Ecosystem Gas Exchange, Primary Production, And Tissue Nitrogen. Free-Air CO2 Enrichment: Responses of Cotton and Wheat Crops. Response of Growth and CO2 Uptake of Spring Wheat and Faba Bean to CO2 Concentration Under Semi-Field Conditions: Comparing Results of Field Experiments and Simulations. Assessment of Rice Responses to Global Climate Change: CO2 and Temperature. Interactions Between CO2 and Nitrogen in Forests: Can We Extrapolate from the Seedling to the Stand Level? Protection from Oxidative Stress in Trees as Affected By Elevated CO2 and Temperature with Mechanistic Simulation Models: Model Components and Research Needs. Progress, Limitations, And Challenges in Modeling the Effects of Elevated CO2 on Plants and Ecosystems. Stimulation of Global Photosynthetic Carbon Influx By and Increase in Atmospheric Carbon Dioxide Concentration. Biota Growth Factor: Stimulation of Terrestrial Ecosystem Net Primary Production By Elevated Atmospheric CO2. The importance of carbon dioxide extends from cellular to global levels of organization and potential ecological deterioration may be the result of increased CO2 in our atmosphere. Recently, the research emphasis shifted from studies of photosynthesis pathways and plant growth to ground-breaking studies of carbon dioxide balances in ecosystems, regions, and even the entire globe. Carbon Dioxide and Terrestrial Ecosystems addresses these new areas of research. Economically important woody ecosystems are emphasized because they have substantial influence on global carbon dioxide balances. Herbaceous ecosystems (e.g., grasslands, prairies, wetlands) and crop ecosystems are also covered. The interactions among organisms, communities, and ecosystems are modeled, and the book closes with an important synthesis of this growing nexus of research. 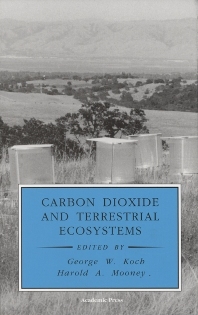 Carbon Dioxide and Terrestrial Ecosystems is a compilation of detailed scientific studies that reveal how ecosystems generally, and particular plants specifically, respond to changed levels of carbon dioxide. Northern Arizona University, Flagstaff, U.S.A.